Happy Tuesday Everybody! 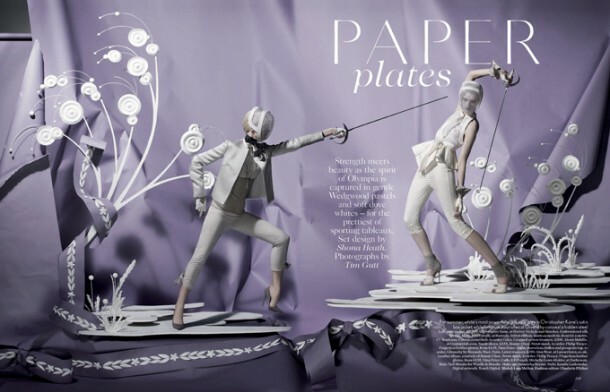 Keeping with the London-Olympic Theme this week, I came across an editorial entitled "Paper Plates" in Vogue UK, that combines the Japanese Art of Origami, with an Olympic Theme, and of course Fashion Photography. It truly makes for a unique editorial. ALL of the decorations you see are made out of PAPER! Have you ever tried Origami? I attended an all girls Catholic private high school, in which one year they invited Japanese exchange students. We had to teach them something and in one class they taught us Origami. I messed mine up so bad! HaHaHa I had creases and folds where there weren't suppose to be any. HaHaHa Well the Japanese girl working with me didn't want me to fail, so she made one for me really quick and said shhhhh! Boyyyy was the teacher impressed when she looked at it! She said, "Kim, good job". 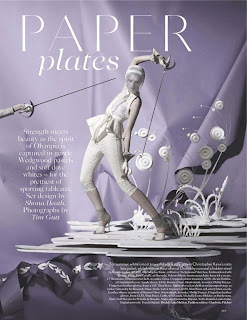 Wow what beautiful paper sculptures! It takes the attention away from the models I think. it's so interesting :) Lovely shoot. I would've cheated too lol! Great post and I love these---so pretty and the clothes are beautiful too! 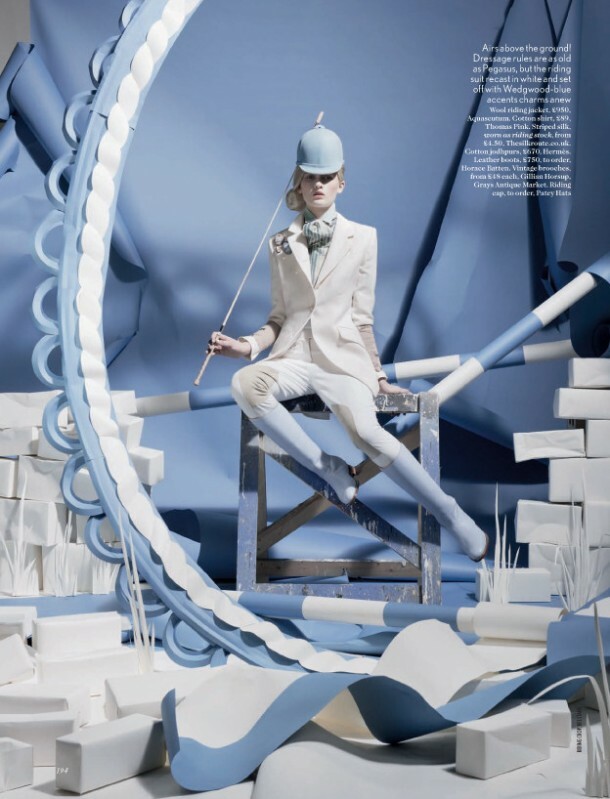 The stunning origami really makes this editorial special and it's so clever how they worked it into an Olympic theme and the pastel colors are so sweet. I love it! Your story made me lol. I've always been fascinated with origami but have never been very good at it. I used to always bug my cousin who's a wiz at it to teach me. Kim, I do plan on putting the photo of Rena with the ice cream on Etsy. I will probably list it sometime later this week. Thanks for your interest :D Hope your week is going well! COOL! these are unspeakably awesome 0 what amazing craft. i LOVE that last photo - it's so perfect. the archery one is my second favorite - i love the belt and dress in it. Wonderful! I LOVE paper art! Thanks for sharing! This was Tim Gutt - I thought it was Tim Walker? Maybe I just think that because it's so fun! 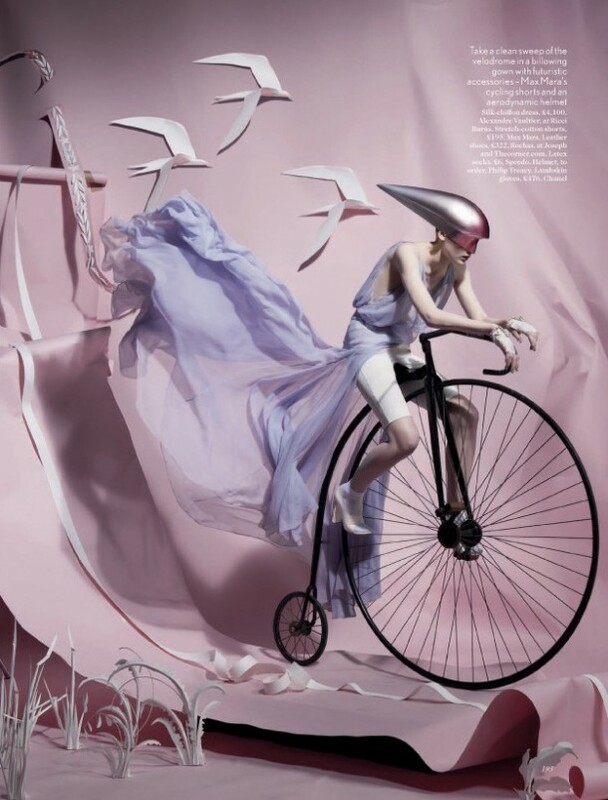 Either way, I loved the whimsical air of these photos! Haha, Kim! I would never have guessed you'd do something like that. lol That's funny. =) I love these photos!! this is such an innovative idea for a shoot! the set designer did an AMAZING job! I'm glad ur friend helped u out in class lol! These are just stunning. How cool and what a great theme for a photoshoot! Wow this is so crazy and awesome. Just stumbled across your blog. Love the Olympics theme! Kim, that was such a sweet story. I did try origami when I was in 4th grade and we studied Japan. I was not so good at it either. Kim, this oragami is so impressive and I can see why that would have been so hard when the Japanese exchange students were trying to teach you in school, I've even tried basic oragami and it's SO hard. GREAT post here, so funny! And nice blog, what about following each other? Visit my blog and let me know! Haha, enjoyed reading your origami exchange student story. This is really an art I want to try out, its not very big here in SA, maybe I need to exchange myself with a college in Japan (high hopes!) What a fantastic editorial, love the softer pastel shades and those dresses are divine! I must say this is one of my favorite editorials in a long while. This is really creative and on point both with current events and fashion. wow, this is an absolutely amazing editorial!! just so inspired! oooh this is so cool!! I can't wait for the olympics! I love paper sculptures!!! They always amaze me me!!! These are gorgeous! I love the art and creativity of this! Wow, this is REALLY neat, you know. Thank you so much for sharing it! This is pretty amazing. I love origami. It can be frustrating sometimes, but I love the feeling when I make something! Happy Tuesday! What an amazing editorial! Thank you for your wonderful comments. Following you back via Google and Pinterest. that's such a cool idea..i couldn't tell at first if those were models or dolls!! Not only are the origami effects beautiful here, I really like the white paint too. Oh wow--these are brilliant! That origami weight lifting...awesome! hey, kim! 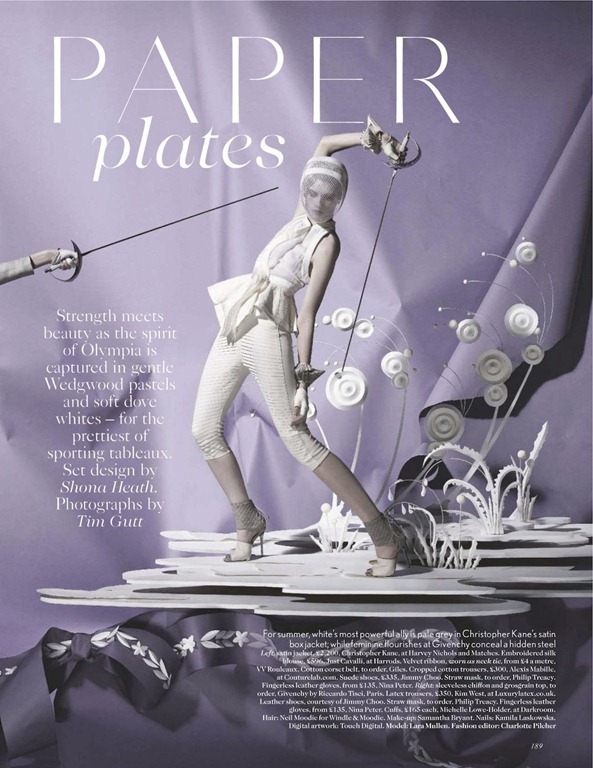 oh, my... these are amazing origami-themed editorials. my son is really into it these days... i remember doing them as a kid in high school. Oh my goodness, I noticed as I was scrolling down your blog that you had a lot of Olympics related posts. Part of me was wondering ( and hoping! ) if you'd posted about this Vogue editorial, and I am so happy you did! I recently made a post about this on my blog, and I think it is so serendipitous that I found yours now.